Today, February 6th, is nestled between the feasts of two extraordinary people. Saturday, February 8th, is the feast of St. Jerome Emiliani, who lived right around the time of the Reformation and devoted much of his adult life to the care of orphans, prostitutes, the sick and the poor. He also founded the order of Somascans (which I had never heard of until doing this research), who look primarily after orphans and troubled youth. 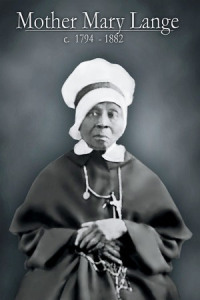 This past Monday, February 3rd, was the feast of the passing of Mother Mary Lange, who came to the US as an exile from now-Haiti in the early 1800’s and founded the Oblate Sisters of Providence in Baltimore in 1828–the first order of nuns of African descent in the United States. The primary mission of the Oblate Sisters was originally to evangelize to and educate African Americans, which at the time meant operating an orphanage and school–all of which occurred in a slave state before the Civil War. Mother Mary Lange died on February 3, 1882, and her cause for sainthood is “on track” according to a 2008 report by the Catholic Review. However, this post is not actually about Mother Mary or Saint Jerome, despite their remarkable stories and heroic actions. In my history of Catholicism, Saints are talked about as examples to follow, but they more often seem like exemplars who had “special grace” that the rest of us could never possess. I don’t know if its the American theologian in me, but I find that argument unsettling because it excuses the rest of us from really trying and sets up certain people in the world as simply better than others. If Saints have “special grace,” then who are we to really try to live their lives? To place this in terms of practical care for orphans, I believe that we live in such a wealthy society that every Christian–single, married, with children, without children–should seriously consider adopting a child or welcoming foster children. I also think that every Church should include a plea for its parishioners to adopt at every service, every week, every year. What does it hurt? In a world where so many evils are so far away and so far out of our control, there are thousands upon thousands of children of any age who are waiting to be adopted here in the U.S. and in Canada at little to no cost to the adoptive parent or parents. Is this too much? I don’t think it is if we take seriously just how deep into scripture lay the call to protect orphans. For Christians who like to only talk about the New Testament, it’s easy to cast off a call to adoption because it is only mentioned once, in James 1:27. However, the scarcity of the New Testament call is not because it was considered unimportant to Jesus and early Christians, but because it was considered assumed as a sacred duty for all Jewish people. Jesus did not preach about orphans because he didn’t have to. Perhaps, if he came back today, he would need to do so again since we rarely reflect on the ethical call of the Hebrew Bible in contemporary Christianity. So, as my #tbt post, I present a throwback to about 2100-2700 years or so ago, in order to remind us just how important the care for orphans is within Christianity. I have divided the Hebrew Bible into its traditional Jewish divisions, so we remember the reality that Jesus was/is Jewish, and that Jesus preached the Gospel within the Jewish tradition of mercy, compassion, and care for the least in society. At the end, I’ve included references from the apocryphal literature, although Jewish Bibles today do not include those writings as canonical. Ex 22:22-24: You shall not abuse any widow or orphan. If you do abuse them, when they cry out to me, I will surely heed their cry; my wrath will burn, and I will kill you with the sword, and your wives shall become widows and your children orphans. Deut 10:17-18: For the LORD your God is God of gods and Lord of lords, the great God, mighty and awesome, who is not partial and takes no bribe, who executes justice for the orphan and the widow, and who loves the strangers, providing them food and clothing. Deut 14:27-29: As for the Levites resident in your towns, do not neglect them, because they have no allotment or inheritance with you. Every third year you shall bring out the full tithe of your produce for that year, and store it within your towns; the Levites, because they have no allotment or inheritance with you, as well as the resident aliens, the orphans, and the widows in your towns, may come and eat their fill so that the LORD your God may bless you in all the work that you undertake. Deut 24:17-22: You shall not deprive a resident alien or an orphan of justice; you shall not take a widow’s garment in pledge. Remember that you were a slave in Egypt and the LORD your God redeemed you from there; therefore I command you to do this. When you reap your harvest in your field and forget a sheaf in the field, you shall not go back to get it; it shall be left for the alien, the orphan, and the widow, so that the LORD your God may bless you in all your undertakings. When you beat your olive trees, do not strip what is left; it shall be for the alien, the orphan, and the widow. When you gather the grapes of your vineyard, do not glean what is left; it shall be for the alien, the orphan, and the widow. Remember that you were a slave in the land of Egypt; therefore I am commanding you to do this. Deu 26:12-13: When you have finished paying all the tithe of your produce in the third year (which is the year of the tithe), giving it to the Levites, the aliens, the orphans, and the widows, so that they may eat their fill within your towns, then you shall say before the LORD your God: “I have removed the sacred portion from the house, and I have given it to the Levites, the resident aliens, the orphans, and the widows, in accordance with your entire commandment that you commanded me; I have neither transgressed nor forgotten any of your commandments. Isaiah 1:16-17: Wash yourselves; make yourselves clean; remove the evil of your doings from before my eyes; cease to do evil, learn to do good; seek justice, rescue the oppressed, defend the orphan, plead for the widow. Isaiah 10:1-4: Ah, you who make iniquitous decrees, who write oppressive statutes, to turn aside the needy from justice and to rob the poor of my people of their right, that widows may be your spoil, and that you may make the orphans your prey! What will you do on the day of punishment, in the calamity that will come from far away? To whom will you flee for help, and where will you leave your wealth, so as not to crouch among the prisoners or fall among the slain? For all this his anger has not turned away; his hand is stretched out still. Jer 5:26-28: For scoundrels are found among my people; they take over the goods of others. Like fowlers they set a trap; they catch human beings. Like a cage full of birds, their houses are full of treachery; therefore they have become great and rich, they have grown fat and sleek. They know no limits in deeds of wickedness; they do not judge with justice the cause of the orphan, to make it prosper, and they do not defend the rights of the needy. Jer 7:3-7: Thus says the LORD of hosts, the God of Israel: Amend your ways and your doings, and let me dwell with you in this place. Do not trust in these deceptive words: “This is the temple of the LORD, the temple of the LORD, the temple of the LORD.” For if you truly amend your ways and your doings, if you truly act justly one with another, if you do not oppress the alien, the orphan, and the widow, or shed innocent blood in this place, and if you do not go after other gods to your own hurt, then I will dwell with you in this place, in the land that I gave of old to your ancestors forever and ever. Jer 22:3-4: Thus says the LORD: Act with justice and righteousness, and deliver from the hand of the oppressor anyone who has been robbed. And do no wrong or violence to the alien, the orphan, and the widow, or shed innocent blood in this place. For if you will indeed obey this word, then through the gates of this house shall enter kings who sit on the throne of David, riding in chariots and on horses, they, and their servants, and their people. Mal 3:5-6: Then I will draw near to you for judgment; I will be swift to bear witness against the sorcerers, against the adulterers, against those who swear falsely, against those who oppress the hired workers in their wages, the widow and the orphan, against those who thrust aside the alien, and do not fear me, says the LORD of hosts. For I the LORD do not change; therefore you, O children of Jacob, have not perished. In Job, the disparagement of orphans is commonly used as a hyperbolic insult which simply means: you are evil. the helpless commit themselves to you; you have been the helper of the orphan. Psalm 68:4-5: Sing to God, sing praises to his name; lift up a song to him who rides upon the clouds– his name is the LORD– be exultant before him. Father of orphans and protector of widows is God in his holy habitation. Proverbs 23:10-11: Do not remove an ancient landmark or encroach on the fields of orphans, for their redeemer is strong; he will plead their cause against you. Esther 2:7: Mordecai had brought up Hadassah, that is Esther, his cousin, for she had neither father nor mother; the girl was fair and beautiful, and when her father and her mother died, Mordecai adopted her as his own daughter. Sirach 4:9-10: Rescue the oppressed from the oppressor; and do not be hesitant in giving a verdict. Be a father to orphans, and be like a husband to their mother; you will then be like a son of the Most High, and he will love you more than does your mother. Sirach 35: 15b-19: For the Lord is the judge, and with him there is no partiality. He will not show partiality to the poor; but he will listen to the prayer of one who is wronged. He will not ignore the supplication of the orphan, or the widow when she pours out her complaint. Do not the tears of the widow run down her cheek as she cries out against the one who causes them to fall? 2 Macc 8:30: In encounters with the forces of Timothy and Bacchides they killed more than twenty thousand of them and got possession of some exceedingly high strongholds, and they divided a very large amount of plunder, giving to those who had been tortured and to the orphans and widows, and also to the aged, shares equal to their own. John, thanks for this compelling post, which gives me much to consider. I think the New Testament does something quite substantial with adoption, since for Paul it is through the Holy Spirit that we are adopted/fostered children of God, and brothers and sisters of Christ. I hadn’t thought about Paul in relation to the moral call to care for the orphan, but now that I do it seems to me that there is an interesting link to be made between the Christian’s baptismal identity and care for the orphan. Without God are we in a position as vulnerable as the orphan who requires compassion and justice? Perhaps so. And if we are God’s adopted children through baptism, then living out that baptism seems to demand our empathy and outreach to others who experience the vulnerability of being orphaned. In other words, if Paul’s analogy functions practically and points to a spiritual reality, then it seems the New Testament issues a particular call to care for the orphaned and to welcome them as family–it flows from our baptismal identity. Thanks for this, Amanda! I was thinking about the Pauline imagery of adoption quite a bit in constructing this post–wondering whether or not to include the theological language with the other Biblical citations. I like the way you discuss it–if we are in a position of vulnerability as orphans in need of adoption by God, can we not extrapolate a particular care for the physical orphans in society? However, I wonder if Paul’s language is closer to doing the opposite in his theological appropriation of the term “adoption.” Since the conception of care for orphans is so rooted in the Hebraic tradition, Paul employs and transforms the imagery into a theological language of mercy and justice for the apologetics of early Christian communities. If they consider themselves as orphans, then God’s acceptance becomes an infinitely merciful act. In this sense, the standard of care for orphans continues in its basic necessity, but “adoption” has become a theological metaphor to understand God’s mercy and our fallen nature on account of sin. I don’t think it’s fair to say that Paul would deny the adoption of orphans (! ), but his theological transformation of the adoptive image without any explicit reference to the social reality of orphaned children makes me wary. I do, however, really like your re-transformation, wherein -because- we are adopted by God, we are particularly called to live out that adopted blessing in society by caring for those who need adoption! I share your hesitancy about Paul’s lack of reference to the social reality; the analogy has the potential to contribute to a sense of “spirituality” that lacks embodiment, and Paul does little (to nothing) to counteract that even if he is not intending to inveigh against the physical. I admit to the same type of tendency–I’ve thought of spiritual adoption in relation to perceiving the world with the eyes of faith, but what you’ve written prompts me to think through the moral consequences of the Paul’s analogy in relation to the Hebrew scriptures. Thanks!